Disclaimer: Please consult your doctor or Registered Dietitian before starting any type of supplementation. This is not intended to be a substitute for medical advice. As the name implies, supplements are meant to supplement an already-established healthy diet. These supplements may have side effects that vary on an individual basis. The American Physical Therapy Association states that nutrition is a part of the professional scope of practice of physical therapists. As physical therapists, we are obligated to at least address the basics of proper nutrition with patients. I recommend referring your patient to a Registered Dietitian for any dietary interventions beyond the basics of nutrition, especially if they have a certain medical condition. Dietary changes may help your patient’s prognosis in physical therapy and overall health. Before we talk about supplements, one of the most important improvements a patient can make to their diet and nutritional habits is to stay hydrated. I cannot tell you how frequently patients will be sweating and breathing heavily during physical therapy sessions but decline a cup of water. Also, a majority of the time, if a patient complains of muscle cramping at home, I ask if they drink adequate water at home, especially if you're working with them using HEP software. More often than not, the answer is no. In an ideal world, patients would drink at least 20 oz. water an hour prior to starting physical therapy. Hydration can also help a patient’s prognosis in physical therapy as physical performance can decline after losing 2% of your body weight in water. As you may know, there are hundreds of different supplements on the market, and it may be extremely difficult to know which ones to recommend. 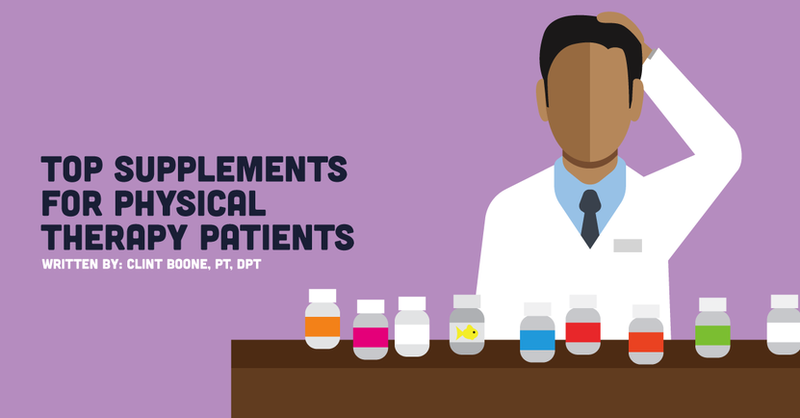 The goal of this article is to go over the top seven safe and effective supplements a patient may benefit from during physical therapy and while staying active on their own. Although these supplements have shown to be beneficial, you must take into consideration a patient’s medical condition or history before making any recommendations to avoid any contraindications. This includes being aware of any allergies or medications a patient is taking that can negatively interact with certain nutrients or supplements. Micronutrients play a vital role in many of the body’s daily functions. Many physicians recommend taking a multivitamin as “health insurance” for your body. You may be missing out on key nutrients in your diet; a multivitamin can help fill the gaps.1 Moreover, various cooking methods can destroy the vitamins contained within food.2 Those who are unable to eat a variety of foods or are at risk for nutrient deficiencies can benefit from taking a multivitamin. Aside from possible “fish burps” one may incur while taking fish oil, this supplement has shown to be relatively safe when taking in recommended amounts - generally 1000mg to 3000mg per day. Creatine can have some negative side effects - mostly GI-related - especially for those trying the supplement for the first time or trying to take too large of a dose at one time.9 It is recommended a patient take creatine as a part of a cycle (usually 4 weeks in duration) and then temporarily cease use of the supplement. As with any supplement, be sure to consult with your doctor and start with small doses to assess tolerance and any potential side effects. Ultimately, Creatine has many benefits—more benefits than the bodybuilding stereotype associated with this supplement—and it can aid your patient when recovering from an injury. While you work with your patients on their recovery, work on minimizing these four words in your PT vocabulary to keep them on a positive track. Vitamin C, or ascorbic acid, contains several health benefits including the prevention of free-radical damage that contributes to aging-related diseases. Vitamin C acts as a powerful antioxidant that has the ability to boost your body’s immune system. It also has an important role in the growth and repair of tissues in all parts of the body. As a result, it can greatly improve your body’s ability to handle physical and mental stress. Supplementing with Vitamin C can help your patient accelerate their recovery from an injury or surgery. It can aid in the recovery of wounds and may help with the repair of any fractured bones or connective tissue dysfunctions. More research indicates that gut health may have a direct impact on overall health. 80% of the immune system’s cells are in the gut. Therefore, probiotics are a supplement that may be worth adding to your daily routine. Probiotics may help reduce gastrointestinal bloating, constipation, diarrhea, and gas.13 Additionally, probiotics may help your body produce vitamins, extract nutrients, absorb minerals, and facilitate the creation of neurotransmitters. Note: probiotics are not to be confused with prebiotics, which are the “fuel” probiotics use to thrive. Sufficient protein intake is needed to both maintain and build muscle mass. By encouraging our patients to increase the amount of protein in their diet we can also help stimulate muscle protein synthesis. As physical therapists, we are exercising our patients to improve their strength, and this can be accelerated by having them properly fuel their body with the right nutrients. The amount of protein an individual should intake depends on factors such as their age, gender, weight, stress factor, activity level, and individual goals. The protein required by an elderly woman with sarcopenia will drastically differ from the requirements of a young male athlete. Although it is possible for individuals to obtain their protein requirement from eating whole foods, supplementation ensures that they will receive adequate protein needed to promote recovery. Again the protein requirements will differ depending on your patient population, but encouraging your patients to consume adequate protein can mitigate any muscle damage. Along with the increased protein intake, try these 11 strength and conditioning practices to aid in the development of new muscle! Using these supplements may help your patients (and you) with individual health-related goals. As always, be sure to consult with a physician or Registered Dietitian before starting any new supplementation programs. It is important to mention that recommending certain supplements without complete knowledge of a patient’s medical history and medications is both ignorant and unethical. To put it into perspective: it is no different than recommending certain exercises without knowing the diagnosis of a musculoskeletal disorder. You can do more harm than good if the patient’s medical condition is not taken into consideration, whether you’re recommending a supplement or an exercise. Are there any supplements that you recommend personally? Please let us know in the comments below. Thanks for reading! Woodward L. Why are multivitamins important? Livestrong. https://www.livestrong.com/article/240179-why-are-multivitamins-important/. October 3, 2017. Accessed May 17, 2018. Cote, R. The importance of taking a multivitamin supplement. HealthGuidance. http://www.healthguidance.org/entry/1032/1/the-importance-of-taking-a-multivitamin-supplement.html. January 2, 2018. Accessed May 24, 2018. Spina Bifida. American Pregnancy Association. http://americanpregnancy.org/birth-defects/spina-bifida/ July 2015. Accessed June 1, 2018. Melnick M. Should you take a multivitamin? Huffington Post. https://www.huffingtonpost.com/2012/08/01/should-you-take-a-multivitamin_n_1725380.html August 2, 2012. Accessed June 4, 2018. Vitamins and minerals: how much should you take? WebMD. https://www.webmd.com/vitamins-and-supplements/vitamins-minerals-how-much-should-you-take#1 Accessed June 2, 2018. Bowden J. Fish oil versus flaxseed oil. Better Nutrition. https://www.betternutrition.com/natural-rx/fish-versus-flax-oil. June 2, 2010. Accessed June 9, 2018. Kendall K. 6 reasons everyone should take creatine. BodyBuilding.com https://www.bodybuilding.com/fun/6-reasons-everyone-should-take-creatine.html. August 2, 2018. Accessed August 9, 2018. Creatine monohydrate: beneficial or just dangerous? Dr. Axe. https://draxe.com/creatine-monohydrate/. Accessed June 17, 2018. Semeco A. 9 benefits of coenzyme q10. HealthLine. https://www.healthline.com/nutrition/coenzyme-q10#section1. October 12, 2017. Accessed June 12, 2018. Coenzyme Q10. National Center for Contemporary and Integrative Health. https://nccih.nih.gov/health/supplements/coq10. July 18, 2018. Accessed August 1, 2018. Sinatra S. Which form of CoQ10 is best, ubiquinol or ubiquinone? Dr. Sinatra. https://www.drsinatra.com/is-ubuquinol-coq10-better-than-ubiquinone-surprising-results-from-my-own-research. Accessed August 7, 2018. Allen M. Experts break down all the benefits of probiotics. TheThirty. https://thethirty.byrdie.com/benefits-of-probiotics--5a7cbfb386960. February 9, 2018. Accessed August 11, 2018. Akkasheh G, Kaskani-Poor Z, Tajabadi-Ebrahimi M, et al. Clinical and metabolic response to probiotic administration in patients with major depressive disorder: A randomized, double-blind, placebo-controlled trial. Nutrition. 2016;32(3):315-320.